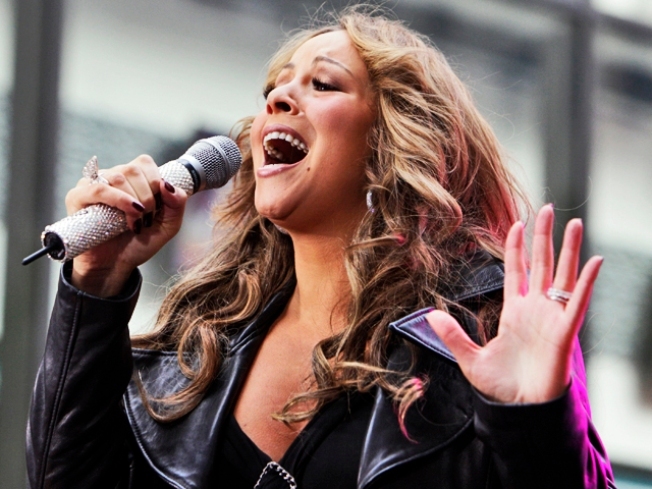 MoshPix: Mariah Carey performs on the NBC's "Today" television program in Rockefeller Plaza. Mariah Carey is not without flaws, as evidenced by the title of her new album “Confessions of an Imperfect Angel,” but her behavior on her current publicity tour is calling into question the veracity of the angelic claim as well. “Her security is doing walk-throughs of her performance locations prior to her appearances, as if she’s the president or something,” said one person who was present at one such sweep. It's even more intense on the day of a Carey performance, says the source. “She’ll show up with more than a dozen people on her team, and she’s been asking that the people who actually work there are removed from the floor and only her staffers be present,” said the source, who adds that the demand is not always met. The level of high maintenance Carey is displaying while promoting both “Imperfect Angel” and her new film, “Precious”, didn’t surprise one person, who has worked with Carey in the past. “We were paying for her travel, her expenses, and yet she still wanted to be compensated nearly six figures just for hair and makeup,” said the source. There was a substantial amount of confusion last week regarding Justin Timberlake and Jessica Biel’s relationship status. Although some celebrity weeklies claimed the two had split (one even linked Timberlake with Rihanna) photos of Timberlake and Biel on vacation together emerged. Us Weekly, one of the publications that claimed the two were going their separate ways, now maintains that their relationship at the very least is “circling the drain,” and if Timberlake is still with Biel, he isn’t acting like it around the ladies. According to papers Kate Gosselin’s attorneys filed in Pennsylvania family court on Oct. 5, estranged husband Jon had 24 hours to return the more than $200,000 he reportedly withdrew from a joint bank account. That money, at press time, hadn’t been returned; whether he returns it or sells his two cars, as the filing demands, remains to be seen. But it’s difficult to even get a comment on the situation, since the papers reveal that Gosselin’s “new” attorney, Mark J. Heller, who earlier this week gave statements to the media about the cash withdrawal, isn’t the point person on the filing. Gosselin’s original divorce attorney Charles Meyer is listed as his counsel, and a request to Meyer’s office to clarify who would handle the matter was met with a puzzling answer. “You’ll have to ask Kate’s attorneys,” was all that was offered up. Kate’s attorneys didn’t respond to calls for clarification.